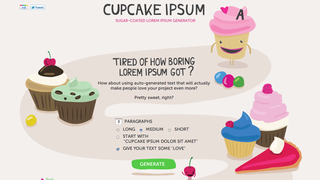 While I'm still not convinced anything will surpass the majesty of Bacon Ipsum, or match the blunt hilarity of Samuel L. Jackson Ipsum, there's something just so deliciously sweet about Cupcake Ipsum. It's also the only text generator I know of where you can sprinkle in a little dash of love. Powder donut cheesecake wafer. I love sugar plum brownie tart apple pie macaroon. Donut wafer dragée pudding. Soufflé I love gingerbread marshmallow cake I love applicake. Sugar plum I love jelly beans powder jelly beans. Ice cream ice cream cupcake liquorice I love. Pastry sweet roll applicake bear claw donut sweet roll. Chocolate carrot cake I love sesame snaps. Pudding pudding chocolate cake croissant donut pastry pie cupcake cookie. Bonbon chupa chups cupcake bonbon lemon drops. Sweet bonbon biscuit jujubes pastry bonbon cookie croissant. Danish chupa chups I love cupcake. Tootsie roll I love soufflé I love chocolate.